Laity Lodge, situated in the Frio River Valley near Leakey, Texas, overlooks a magnificent vista of forested hills and jagged rock. Far from urban chaos, this retreat stands as a haven for those needing to explore pressing questions, absorb the peace of the Spirit, or simply run into God. On my first visit to Laity Lodge, when I was told not to turn left at the Frio River but in the Frio, I knew I had reached the land of Oz. After my first few days there I knew that, more even than Oz, it was a holy place. The high hills spoke of it. The river spoke of it. The “blue hole” where we swam spoke of it, as did Betty Ann Cody’s a cappella singing of “There Is a Balm in Gilead,” which left my face streaming with tears and which I will remember until the end of my days. I don’t believe I have ever known a place as full of human kindness and openness and grace as I have found in virtually everyone I met there….I doubt I will ever get there again, but it will always remain part of the best of who I am. 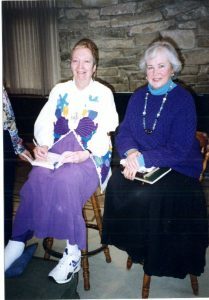 Madeleine L’Engle and Luci Shaw at Laity Lodge, 1997. Laity Lodge speakers whose papers are archived at Wheaton College include Frederick Buechner, Madeleine L’Engle and Luci Shaw. 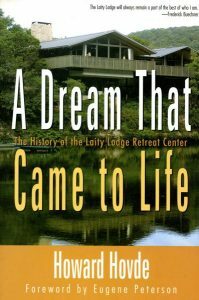 The story of Laity Lodge is chronicled by former director Howard Hovde in A Dream That Came to Life: The History of the Laity Lodge Retreat Center (2007).